The economic history of the United States is cyclical in nature with recessions and expansions. Some of these fluctuations are severe, such as the economic downturn experienced during Great Depression of the 1930’s which lasted for a decade. Why does the economy grow at different rates in different years? What are the causes of the cyclical behavior of the economy? To analyze questions like these, we must move beyond discussing macroeconomic issues one at a time, and begin building economic models that will capture the relationships and interconnections between them. This module introduces the macroeconomic model of aggregate demand and aggregate supply, how the two interact to reach a macroeconomic equilibrium, and how shifts in aggregate demand or aggregate supply will affect that equilibrium. 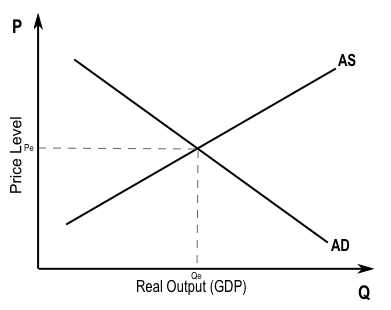 This section also relates the model of aggregate demand and aggregate supply to the three goals of economic policy (economic growth, stable prices (low inflation), and full employment), and provides a framework for thinking about many of the connections and tradeoffs between these goals. This model will aid us in understanding why economies expand and contract over time. 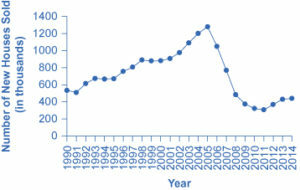 A simple version of the AD-AS graph is shown in Figure 1. The horizontal x-axis shows the real output, or GDP of the macroeconomy. The vertical y-axis shows the price level. Figure 1. Aggregate Demand-Aggregate Supply Model, showing equilibrium at Pe & Qe. This video provides a nice overview of the key concepts surrounding the aggregate demand-aggregate supply model that we will cover in the next few sections. Watch it carefully so that you have a context for the explanations, diagrams and examples that follow. 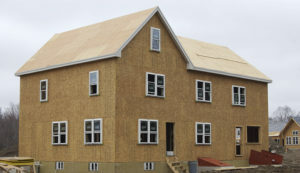 The housing bubble and the crisis in the financial markets were major contributors to the Great Recession that led to unemployment rates over 10% and falling GDP. We can show this using AD-AS, but first we need to learn more about the model. While the United States is still recovering from the impact of the Great Recession, it has made substantial progress in restoring financial market stability through the implementation of aggressive fiscal and monetary policy.